Team Garneau-Quebecor is proud to present the riders that will be on the starting line one of the most important races on their calendar: the Tour of Alberta. This year, Garneau-Quebecor has the chance to welcome a special guest, a rider of the Rwanda National Cycling Team, Janvier Hadi. Janvier won the Prologue of the 2013 Tour of Rwanda. He also became the first Rwandan to podium at the Continental Championships in Egypt in 2013, taking third in the U23 Road Race. For Louis Garneau, Janvier Hadi's participation is another way to provide a stepping stone in a cyclist's career: "It's a pleasure for me to see Janvier Hadi with our Team Garneau-Quebecor for the Tour of Alberta. Janvier is a child of the genocide that took place 20 years ago this year and to which he lost family members. Today, he dreams of Olympic Games and Tour de France. I'm proud to make him discover our region and to help him realize his dreams. Good luck Janvier!" 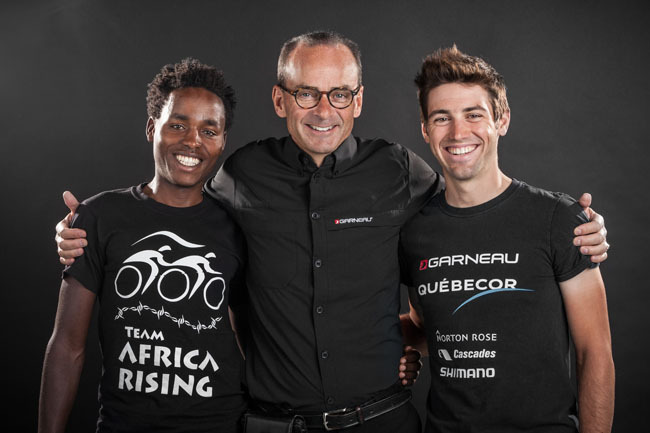 "We greatly help the Rwanda National Cycling Team in its development and to invite one of its riders to be a part of our Continental team truly reflects our mission to help young riders get to the next level," added Louis Garneau. The team will also include Pierrick Naud, Geoffroy Dussault, Benjamin Chaddock, Jake Kauffman, Simon-Pierre Gauthier, Julien Gagné and Adam Farabaugh, who wore the Most Aggressive Rider jersey of a stage in 2013. Farabaugh hopes for even more this year for the team: "I would like to further improve upon getting the Most Aggressive Rider's jersey on Stage 5 last year with a more established presence in the breakaways along with helping our sprinters on the sprint stages to get the team increased visibility and results. I think it will be very achievable for both myself and the team to get a number of top 5's. If we can do this we will have a very successful race." Louis Garneau is also proud to be a sponsor of the race, providing the official Stage Leader, Best Sprinter, Best Climber, Best Young Rider, Most Aggressive Rider as well as Best Canadian Rider jerseys. In addition, the company has created an event jersey that will be offered to consumers on site and online at tourofalberta.ca.